With a new 3-MW solar power system, and a wind power system already in place, the seaside town of Scituate recently became the first community in Massachusetts to be powered 100 percent by renewable energy. Scituate, a mid-sized seaside town southeast of Boston, is proving to be wickedly good at renewable energy-last year, in fact, it became the first town in the Commonwealth of Massachusetts to be powered 100 percent by renewable energy. The town already had a 1.5-MW wind turbine (built in 2012), and the completion of a new 3-MW solar project atop Scituate's capped landfill means it is now able to use 100 percent renewable energy to power all of the town's municipal facilities. When the solar project was completed in late 2013, it was a proud moment for the town-and for the project's developer, Brightfields Development LLC, a leader in brownfield remediation and solar energy development. 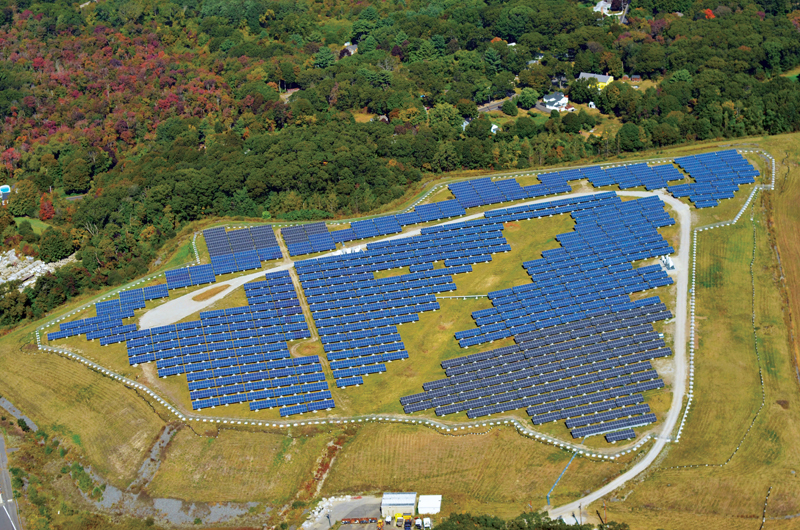 Brightfields Development co-founder Pete Pedersen noted this kind of capped landfill-to-solar project is especially suited for this region of Massachusetts. There are other towns across Massachusetts that have carried out similar projects, Pedersen said. Doing something productive with closed landfills is an attractive option in a land-starved part of the country like New England-especially in eastern Massachusetts. In virtually all of these communities, closed landfills (although they served their purpose when they were operating) do nothing but cost towns money for upkeep. "With solar power, though, with its geotechnical load on a landfill being fairly minimal, these towns have realized that there is a way to have solar power and profitably deploy land that had not been an asset to them, but a cost," says Pederson. There seems to be plenty of potential. One estimate says Massachusetts has 328 capped landfills across the state, and while not all would be suitable for solar installations, there are a lot of cash-strapped towns that would be happy to look into generating power. Brightfields Development, as its name implies, was specifically formed in 2009 to tap into the opportunity to re-develop brownfields and landfills into brightfields-renewable energy facilities. "To date, we have just done solar projects," says Pedersen. "But that does not mean there aren't applications for wind, biodigesters, or other forms of renewable energy." One project they proposed, for example,combined solar power with fuel cells. "The real answer to our energy needs," says Pedersen, "is not just solar. It provides valuable energy during peak hours, but it is intermittent. The best thing is to combine it with other technologies, so we can provide 24/7 power and, very possibly, battery technology to store some of the energy production. We think solar is a great application, but it's even better when it can be married with complementary technologies to make it a continuous source of power." Brightfields and its associates in the project showed a high degree of resourcefulness to get the solar project going and see it through to completion. The town of Scituate, whose name is derived from satuit, an Indian word for cold brook, initiated a Request for Proposals process in 2010, which was won by Brightfields. "We went into negotiations with the town for a power purchase agreement in which the town was to be the offtaker and, separately, that the town was the leasor of the landfill property, and we were the lessee. "One of the great things with Scituate," Pedersen noted, "was that just before they issued the RFP for solar, they concluded arrangements for their 1.5-MW wind turbine, and it was commissioned while they were getting their permits in place for the landfill." While they were building the solar project, the 1.5-MW Sinovel wind turbine was already up and operating. With this solar project, and really most solar projects in the U.S., a town can be very willing to look at solar, but there are major pieces that have to be in place for a project to move forward. "The reality for a solar developer like ourselves is that the solar market is largely dependent on the state incentives that are provided, and fortunately Massachusetts has been good in that area," says Pedersen. "But the 'bucket' of incentivized solar is finite," he added. The state recently came to the end of its first bucket of incentivized power and is looking at the next bucket of 1200 MW. State support for renewable energy is strong. Massachusetts Governor Deval Patrick has set a goal of achieving more than 20 percent of state electricity generation from renewable energy sources by 2020-totaling 1,600 megawatts of solar power and 2,000 megawatts of wind power-as part of a plan to reduce greenhouse gases. The vast majority of these projects will be conventional. But what about financing a solar project on a landfill site? "Is it challenging? You bet it is," says Pedersen. "A project like this should be a good candidate for long-term project financing, but conventional bank financing is much more difficult because of the specter of environmental liability. For folks like us at Brightfields, we deal with that all day, every day, and it's not that mysterious-but we are in the vast minority. "But because we have long experience re-developing contaminated properties, we have found financing sources ready to absorb the risk." Who, he adds, do not shy away from the environmental specter that hangs over a landfill. "We have a pretty good understanding of what the capital markets need to be willing to go ahead and finance a project," he says. Brightfields' expertise in solar energy projects, site remediation, landfill design, and long-term care for environmentally challenged sites was seen as a vital component of the project's development. What really drove the Scituate solar project financially were part-nerships with Main Street Power Company Inc., an owner and operator of solar assets; MS Solar Solutions Corp., an indirect wholly-owned subsidiary of Morgan Stanley; and Syncarpha Solar LLC, who was co-developer on the project. Syncarpha Capital acquired the project from Brightfields in early 2012 and worked closely with Brightfields to complete the development and financing for the project. ownership of the project and will maintain the array for the 20-year life of the power purchase agreement with Scituate. The Scituate solar array is the 200th system developed by MS Solar Solutions and owned by Main Street Power but marks their first landfill project completed together. "Installing solar on a capped landfill makes sense." says Eric Hinckley, senior vice president and chief technology officer of Main Street Power. "It truly is a triple bottom line project: creating savings for the town, promoting advancement of the solar industry, and repurposing unusable land responsibly." The involvement of a blue chip financial firm like Morgan Stanley, through MS Solar Solutions Corp., is encouraging to Pedersen. "That alone represents a pretty big change in risk tolerance for solar on landfills. Financing is still very difficult, but it is changing and migrating in the right direction, where I think more people will be comfortable providing funding for these kinds of projects." On the construction side, Gehrlicher Solar America Corp. was EPC on the project, and civil and structural engineering firm AMEC was involved with the project. In early 2013, Gehrlicher Solar America actually opened a regional office in Boston, to support its rapidly expanding New England market. To date, Gehrlicher has completed 77 MW of solar projects in Massachusetts and has an additional 14 MW under construction and development. Lori Ribeiro, director of business development for Gehrlicher Solar America, has been involved with brownfield-to-solar projects for some time. She worked as a consultant on a solar project in Brockton, Massachusetts, on what was then the largest brownfield-to-brightfield project in the U.S., which saw the installation of a 465-kilowatt solar generation facility on a former EPA Superfund toxic waste site. For Pete Pedersen and John Hanselman of Brightfields Development (inset photo above) projects such as the new 3-MW solar power system in Scituate reinforce that the future for redeveloping brownfields and landfills into renewable energy projects is indeed bright enough that-as the saying goes-they need to wear shades. Ribeiro says the Scituate project was a good fit for Gehrlicher. "It was exactly in our strike zone," she says. "Most of our projects in the last few years have been in the 1-MW to 6-MW range." She noted that they are starting to get involved with projects on the west coast where solar projects tend to be in the 25-MW range, which is much larger than on the east coast. Through her work in environmental consulting in the region, and now with Gehrlicher, Ribeiro knows New England and Massachusetts solar policies well. She has been involved with the Solar Energy Industries Association, the New England Clean Energy Council, and other industry stakeholders, in putting the case for solar power before the states, especially concerning SRECs. "It's really important for a state to get the incentives aligned so you are not in a position where part of the market is working, and part of the market isn't, and you have to keep going back to the legislature, asking for a fix." With brownfield projects, Gehrlicher deals with a number of aspects for each individual project, Ribeiro said. "On the technical side, there is the need to fully understand the environmental conditions on the site. In some cases, the site may have been remediated, and there is no real issue. In other cases, there is a cap that contains toxic materials, like the Brockton project, and you have to make sure the project does not penetrate the cap." On the regulatory side, landfill post-closure use permits have to be in place, essentially giving a government sign-off that there are no remaining environmental conditions related to a site. As Brightfields' Pete Pedersen not-ed, there is also the financial side to consider, since brownfield sites are not conventional solar project sites. "You might have to do some extra things, such as not penetrating the soil and using a ballasted system, and there could be extra expenses for concrete and above-ground conduit and metal trays," says Ribeiro. In the case of the Scituate project, Ribeiro described it as a "pretty typical" landfill, sloped around the edges with a flat top. "So we were able to develop the solar around that flat top." She noted that although there was some challenge in getting the large ballast blocks up on site, the civil work was limited. "We just had to do a bit of scraping of the surface to put down some crushed stone as a base to sit the ballast blocks on. We did not have to do a lot of grading and earth work." In the spring, they ran into some wet weather-not a surprise in Massachusetts-and they had to stop moving construction vehicles for a few days, here and there. As part of the landfill closure permit, an engineer was on site to oversee the project and site conditions, and the engineer determined if work had to stop due to muddy conditions. Since the site was a landfill-rather than regular land-that had to be accounted for in a number of ways in the design and engineering of the project. Especially in dealing with subsidence, the shifting of material within the landfill. "When you have any kind of waste," explained Ribeiro, "the composition can change over time. If materials are biodegrading, the cap can shift. Part of the design has to take into account how much settlement has already occurred at the landfill and what the anticipated settlement will be in the future. Structural and geotechnical engineers review it to determine what can be put on weight-wise, so if there is subsidence, the project will not be impacted by that." This can be managed using mounting structures and conduit that can handle settlement that might occur. The solar installation is comprised of 10,560 modules from Canadian Solar, high efficiency inverters from Advanced Energy, and aSchletterPvMax ballasted ground mount racking system. "The Schletter racking has held up admirably," said Brightfields' Pete Pedersen. "For this particular application-where we were constrained not so much by the space available as much as by the town loads, on how much solar we could build-we thought Schletter was a great match." Gehrlicher frequently uses Mass. Electric Construction Co. (MEC) as the electrical contractor on its Massachusetts projects. "They were important to getting the job done on time and delivered high quality work," said Ribeiro. There were time constraints on getting the project completed, but Ribeiro noted that some of that was self-imposed. With the project having been in the works for a while, everyone involved-from the town to the developer to the suppliers-wanted to deliver the much-anticipated project as soon as possible to the town and its residents. "There was so much excitement in the town about getting this great solar project built. And it just took a while to come to fruition." In the end, everyone delivered. What was a financial burden to the town is now a powerful asset-and pretty good looking, to boot. "The site is near the water, and the wind turbine is in the background, and combined, they are now meeting 100 percent of the town's needs with renewable power," says Ribeiro. The neighbors love the project. "Solar power really was the perfect solution for a landfill site," says Ribeiro. "When you are developing projects in an urban area, there are a lot of concerns. But with a solar project, there is no noise, there is no pollution, and there is no traffic. Those are the three things that neighbors care the most about."